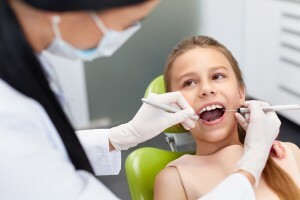 Does My Child Need to See their Pediatric Dentist in Tappan for a Toothache? When your child is in pain or does not feel well, you know right away that something is not right; however, discovering the cause of their discomfort can be a bit difficult. Often, children are not able to communicate what they are experiencing, especially when they have tooth pain. This can make it difficult to help your child. If they develop a toothache, it is often the result of decay. As a parent, there are certain things you can do at home to help assess the situation before calling your pediatric dentist in Tappan. At Smile More Kidz, we will find the cause of their pain to put a smile back on their face. When a toothache develops without any apparent cause, it is often an indicator of a cavity. Children are especially prone to tooth decay as it is one of the most chronic conditions we treat. In fact, it is estimated that 23% of children under the age of 11 currently have one that is untreated. If you suspect your child has a cavity causing their pain, it is important to assess their symptoms. In some cases, you may be able to see the decay as it can cause white spots to appear on the teeth. Over time, they will start to turn brown. If it has progressed to more advanced stages of decay, you may see a visible dark hole. Your child may complain when eating or drinking because their tooth has become more sensitive. It may hurt when exposed to temperature changes and sweets. There may even be pain when they bite or chew. How Can the Tooth Be Treated? If you child develops a toothache, you need to schedule an appointment with their dentist in Tappan right away. Our family-friendly team at Smile More Kidz will find the underlying cause of their discomfort. If a cavity is the problem, we will treat the decay and provide a filling to rehabilitate the tooth’s health while stopping their pain. We may recommend additional treatments to help ward off dental caries in the future, like a fluoride varnish. We will also discuss preventive oral hygiene tips to help protect their teeth. As soon as the first baby tooth erupts, your child needs to learn healthy oral hygiene habits. Teach them how to correctly brush their teeth twice a day using a fluoride toothpaste for two minutes each session. This can seem like a long time for a child, so make it fun by turning on their favorite song. As they get older, show them how to floss their teeth once a day. Often, dental flossers are easier for small children. To reduce the risk for decay, limit their consumption of sugary foods and drinks. In addition to home care, your child needs to see their dentist twice a year for a cleaning and checkup. Together, we will set the right foundation for a lifelong healthy smile. Contact our office today to schedule their appointment. Comments Off on Does My Child Need to See their Pediatric Dentist in Tappan for a Toothache?